We all have clothes that we love, either it fits perfect to us, or it’s so comfort that we want to stay all day in it. Whatever the reason is, we wear this piece of clothing constantly, sometimes for several days. It probably happened to you after arriving in the evening from a trip, immediately to put your favorite clothes in the washing machine, and immediately after that in the dryer, in order to be ready for the next morning. Once I dried my favorite pants with a hair dryer.. Don’t laugh 🙂 Ah love ..
Over time, our favorite pants get damaged, especially cuffs. If we wear them for a long period, they end up with frayed cuffs fabric. The same happens with the pants we buy for our children. Because they grow very fast, usually we buy clothes several sizes larger, so they end up the same way. On many occasions, we need a seamstress to hem our pants. This can cost a lot of money and, in the end you can get your pants far from the original ones. But, we have a great news. There is a simple and easy way, to dial with this kind of problem by your own. You can learn how to cut and hem your pants and not to lose the original hem line. Do It Yourself Divas, popular YouTubers, make videos in which they provide amazing DIY tricks about decoration, hairstyles, clothes, cleaning products and many other. In this video, which been viewed by over 1,3 million viewers, they show you, step by step how to hem your pants, and maintain their original look as like you bought in the store, with its original cut at the end. 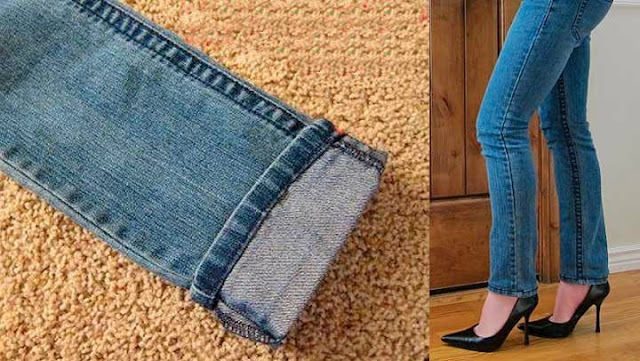 We know you’ll love this useful trick, because if you have the time, you can hem your pants, without any help, which means you are going to save your money, and surely you’ll love your pants look like after.